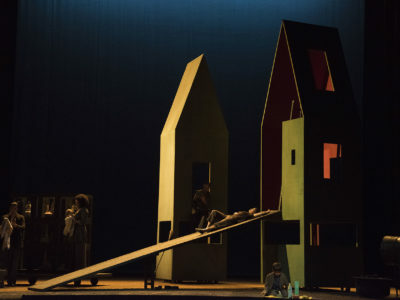 Premiered on the 29th of may 2016 at the Opéra de Rouen Normandie – Théâtre des arts. Coproduction Le Poème harmonique & Opéra de Rouen Normandie. Extracts from Twelfth Night, Hamlet, Richard II, Macbeth, A Midsummer Night’s Dream, The Tempest. How did this project for a staged concert revolving around Purcell and Shakespeare come about? It was Vincent Dumestre’s idea. A little over a year ago, he came to see Xavier Dayer’s Contes de la lune vague après la pluie that I was directing at the Rouen Opera. He called me a few days later to talk about this project he was working on with Ivan Alexandre, who has a deep knowledge of both Purcell and Shakespeare and who was starting to put together the music and texts. What initially appealed to me was the idea of working with Vincent Dumestre and Le Poème Harmonique, whose work I’ve been following for years; and then Ivan Alexandre, whom I had met before and with whom I was delighted to work; and also Geoffrey Carey, who is an actor and an extraordinary man, whom I’ve been encountering for years but never worked with. And Shakespeare, and Purcell, of course! But the living are important, too – very! Is this your first foray into baroque music? I’ve been listening to Purcell for many years, on a private level, and I worked with his music on stage last year, in a show we created at the Scène National 61 in Alençon and at the Paris Philharmonie, and that’s touring this year as well: Love I Obey, with Rosemary Standley. This is a “staged” recital, with some painted backdrops (loaned by the Rouen Opera, which has a unique collection of them in France), and with lights and costumes by Clémence Pernoud, who is also working with me on this new show. In it, Rosemary Standley performs two Purcell songs, along with songs from the American folk repertory. And as an encore, she sings a song by The Pogues, and another by Henri VIII. Elisabeth Geiger accompanies both of them on the harpsichord, and I’m delighted to say she is also part of To Be Or Not To Be in Rouen. Perhaps thanks to that experience, the first thing I thought of when preparing this show was Swinging London of the 1970s, when Purcell was back in fashion and his music was quoted by The Who and in Kubrick’s film A Clockwork Orange. What is it about Shakespeare that you relate to? I think Shakespeare is one of those authors you have a personal relationship with, even if it’s just a few words of his – like the show’s title, To Be Or Not To Be, which is probably the best known line from a play in the world. The idea is to go further than those few words and let people hear some of the most beautiful passages from Shakespeare. You might think that, taken out of context, those long soliloquys would lose their meaning, but I don’t think so at all, because Shakespeare puts his characters in situations in which they find themselves in such an emotional state that they are going to confess to everything, or abandon everything, or pull out all the stops. They can open windows we hadn’t noticed because we didn’t even see the walls. His characters are often walking on a tightrope, and we’re down below holding our breath, because they could fall and we could fall with them. And they stay with us long after the curtain has dropped, just like Proust’s characters. You can forget their words, but not their message. What aspects did you want to explore? Conceiving an evening in which songs and instrumental pieces by Purcell would alternate with extracts from Shakespeare is extremely satisfying but also very strange, because it takes a form that, while not totally new, is not always an easy one to achieve: either you accept the rather artificial side of it and do a kind of “reading-recital”, or you try to see how the music and words can echo each other by creating a story. That is what we did, in imagining an initial situation between a singer and an actor who, following a misunderstanding, fight for the stage. A dialogue begins between the two, which in fact is one that has been going for centuries: what is more important, the words or the music? Do we love a song for its lyrics or for its tune? Richard Strauss composed an opera on that theme, Capriccio, and it was down this very serious and yet quite futile route that we decided to go. Was it a challenge creating a dialogue between a singer and an actor on stage? Yes, and I think that’s one of the most exciting aspects of this project. Singers and actors do in fact often share the stage, increasingly so at the theatre, and at the opera, too, where few productions do without actors, and not just for as extras, as they’re still unfairly referred to. However, it’s true that they don’t often speak to each other on stage. Nicholas Tamagna and Geoffrey Carey are from two different generations, one defends the theatre, the other the music, but perhaps, after a while, they start to realise that they’re talking about the same thing. 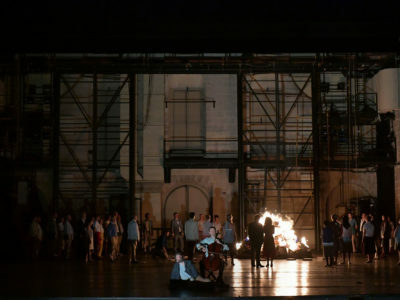 There’s a difference between mise en espace (“spatial arrangement”) and the full-scale mise en scène (staging) of an opera. How do the two enrich or limit your work? I realised recently that mise en espace is the same thing as mise en scène but without the budget! I’m joking, of course – but there’s an element of truth in it all the same! People use the term mise en espace when they get a stage director to come in and work on the show with a light hand; in other words, almost without everything that makes a staging. But what’s at the heart of a staging is there – the ideas, a way of telling the story using the elements and the constraints that you have. Working fast and with little. I am fortunate, however, to have Bertrand Couderc with me for the lights and Clémence Pernoud for the costumes, and even if they have to work around the same constraints, I think it’s possible to create something fresh, something that’s not quite mature but that has that greenness, that charm of an early work or sketch. Last month I saw an exhibition in New York titled “Unfinished”, about unfinished works. It’s a beautiful idea, I think. What drives your artistic approach? When I’m at the theatre or the opera and the lights go out, I like to believe in what I’m seeing, to forget after a few minutes that I’m in a theatre. That’s what I look for with the actors and singers and the other professionals in my crew; something we build together and that doesn’t need to be naturalistic or realistic for people to believe it. It’s something else, something in the intensity of the gesture, or in a look, all of the impressions that are conveyed to us from the stage. For that to happen, not only do the actors and singers have to find their way through the work but they also have to do so together; the director is there to accompany them in this process which is utterly fascinating, but fragile. What you hope for is that moment when you are surprised by the work, by the text or by the music, by what you are in the process of making of it; when suddenly you get the impression that you are discovering or understanding something you hadn’t seen before, or a feeling you weren’t expecting. Hence the idea of confrontation, like the one at the heart of this show: Shakespeare and Purcell did not know each other – Shakespeare died in 1616 and Purcell was born in 1659; but what happens when one man’s words meet the other man’s music?